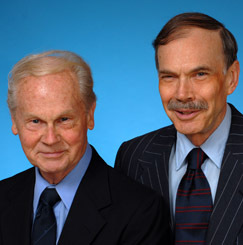 Zasadil ( left ) and Simpson have been partners since 1962. Since their retirement they have been supportive of gay issues, including on gays in the military. Zasadil was born October 1924 and Simpson January 1939. Zasadil served in the Army Engineers Band from 194301946. Simpson was in the National Guard from 1956-1962. They support the efforts of the American Veterans for Equal Rights in fighting to the lift the military's gay ban. Zasadil can often be seen in his World War II-era uniform at pro-gay military events.